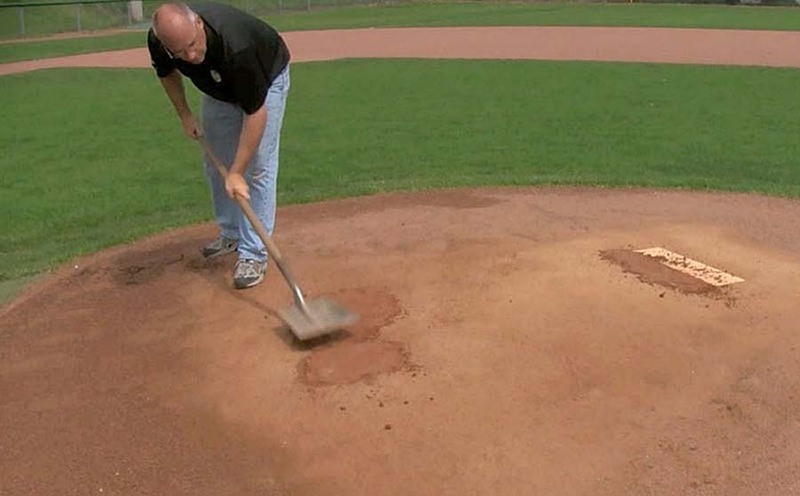 Shovels are the most basic of tools used by the groundskeeper. 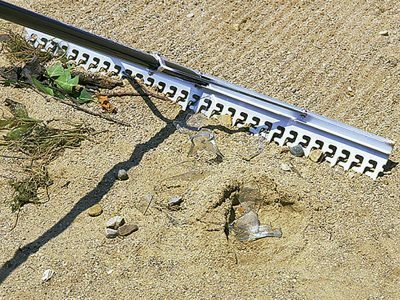 While primarily used for material movement or excavation, round and square end steel shovels can have their front edge sharpened with a grinder to also make them more effective at shaving off compacted clay and soil. Shovels are also an effective tool for mixing clay when remoistening. 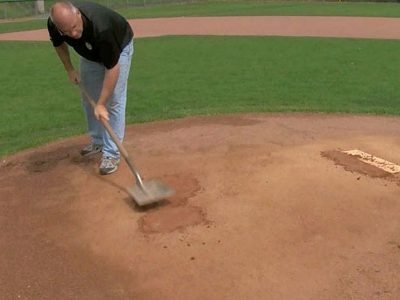 Working in moisture with a shovel ensures even distribution and prevents clumping. 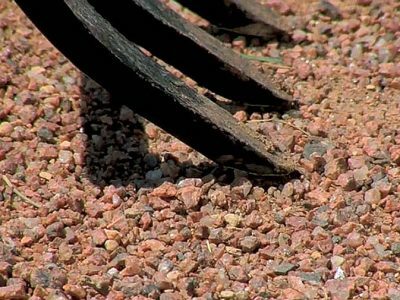 The back heel of a square end shovel can be used to initially pack or “seat” new clay repairs in high wear areas before tamping begins. 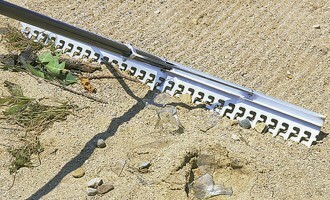 Moving material or removing debris is the primary use of scoop shovels. 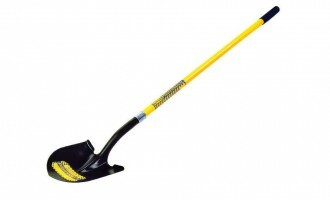 The wider mouth of the scoop shovel makes it easier to collect large piles of debris. 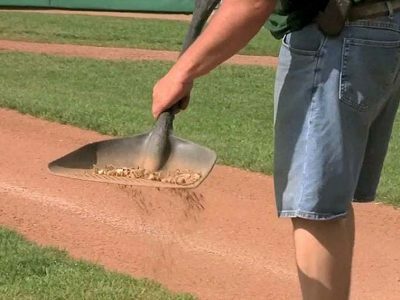 If you are scooping debris off the infield that was left by a drag — or was left over from the repair of the mound or home plate — then you may want to use a sifter scoop shovel so you don’t throw away good topdressing or soil. 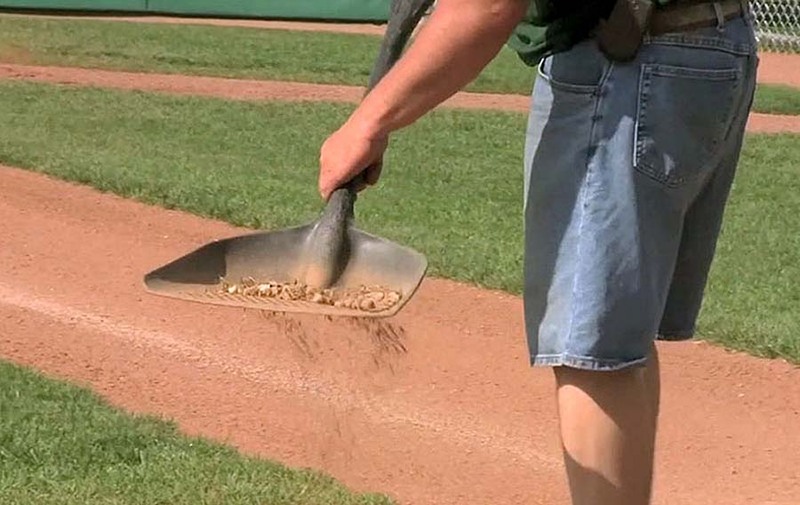 The sifter scoop will sift through the good material and leave your shovel with only the waste that you don’t want left behind on the playing field. 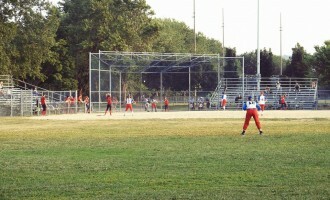 Like shovels, there are many types of rakes that are used in sports field maintenance. Some for grooming and finishing, other to cut or rip into soil. For grooming and fine grading many groundskeepers turn to an aluminum rake between 24″ and 48″ wide. You’ll have several teeth patterns to choose from depending upon what you are looking to accomplish. 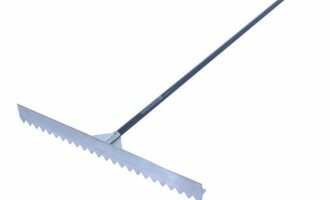 The most popular rake is the standard long tooth grooming rake. 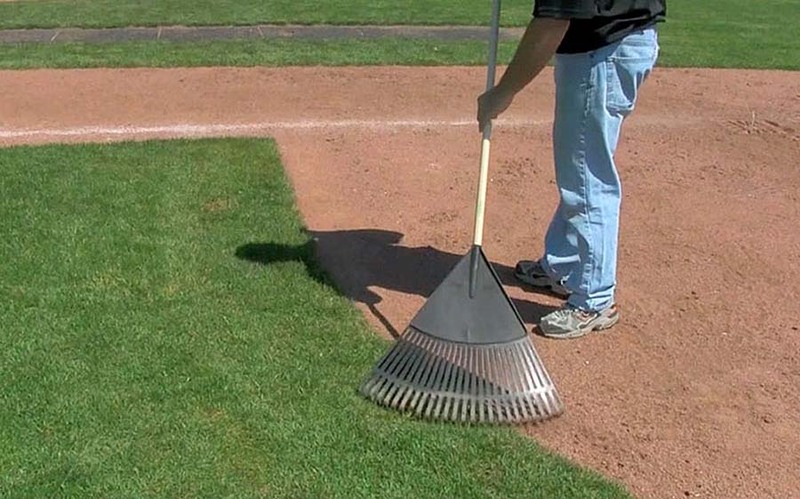 This rake has long, rounded-end teeth that are designed to finish grade without excessive penetration of the infield surface. 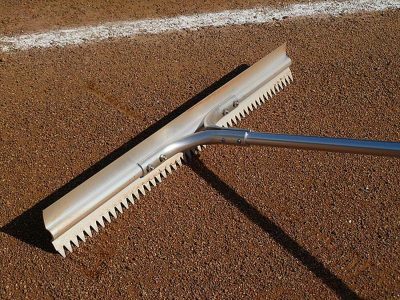 These rakes, like many of the grooming rakes, have a smooth straight edge on the opposite side of the rake head for smoothing and leveling. 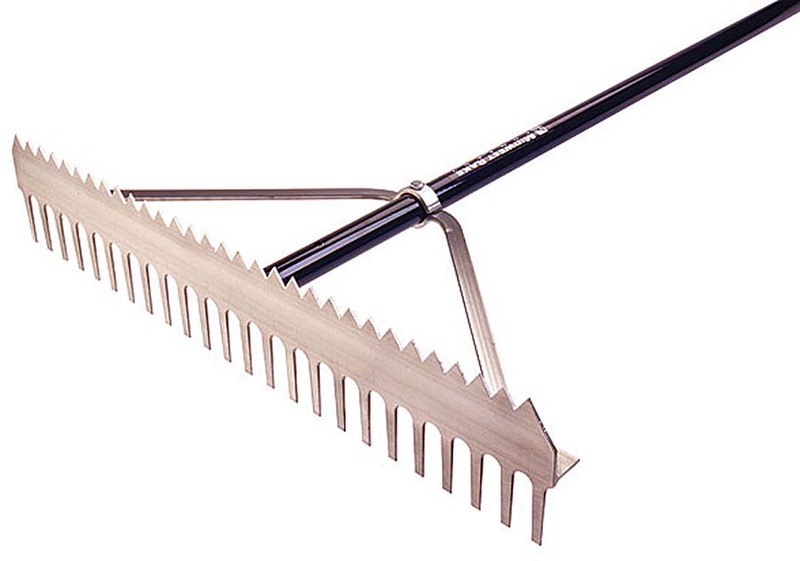 These grooming rakes have triangular shaped teeth that are sharper than the long tooth grooming rakes. 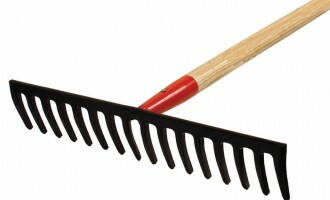 These will penetrate soil better than their long toothed counterparts, and they leave a more fine textured rake print. 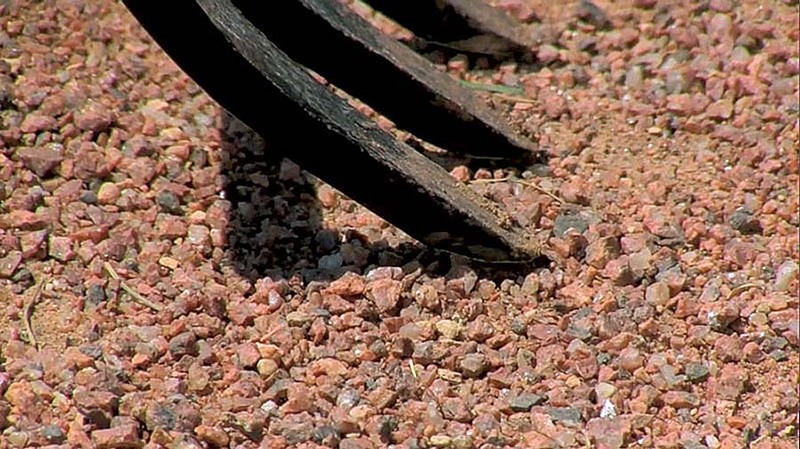 This rake more easily sifts smaller pebbles off a soil surface with its smaller voids between the teeth. 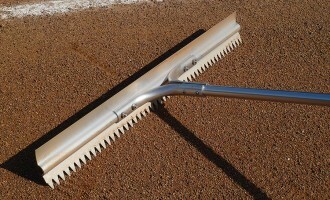 Again, these rakes have a straight edge on the top of the rake head for leveling. 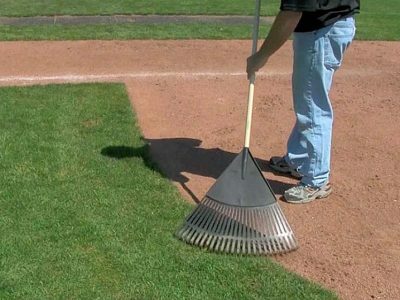 The “double play rake” (shown right) gives you a short tooth rake that you can quickly flip over and use as a long tooth rake. 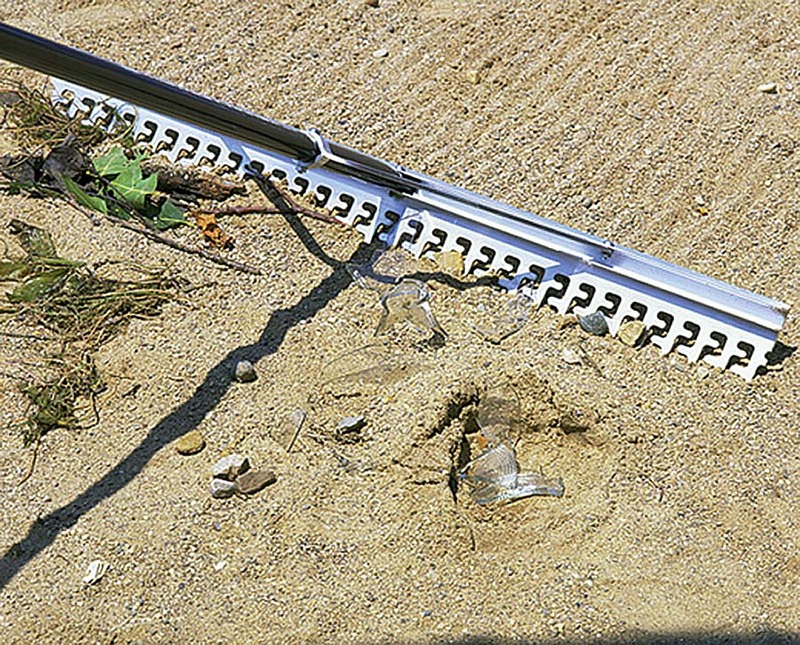 This rake is used specifically for screening stones, pebbles, and other unwanted debris off a soil surface. The jagged filler between the teeth helps reduce the size of the gaps between the teeth to help sift out the unwanted. 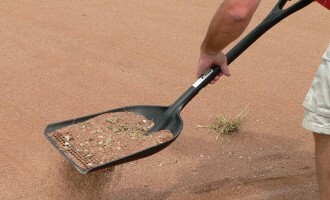 A long tooth rake can also be used to sift out debris by pulling it toward you with the rake head at a 45 degree angle. 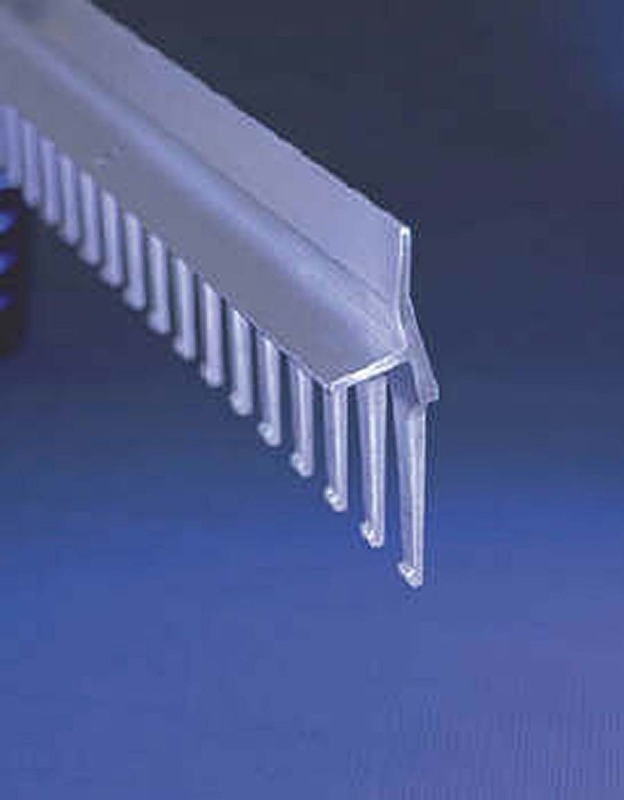 This angle creates a narrow space between the teeth, making a long tooth rake another option for removing debris. 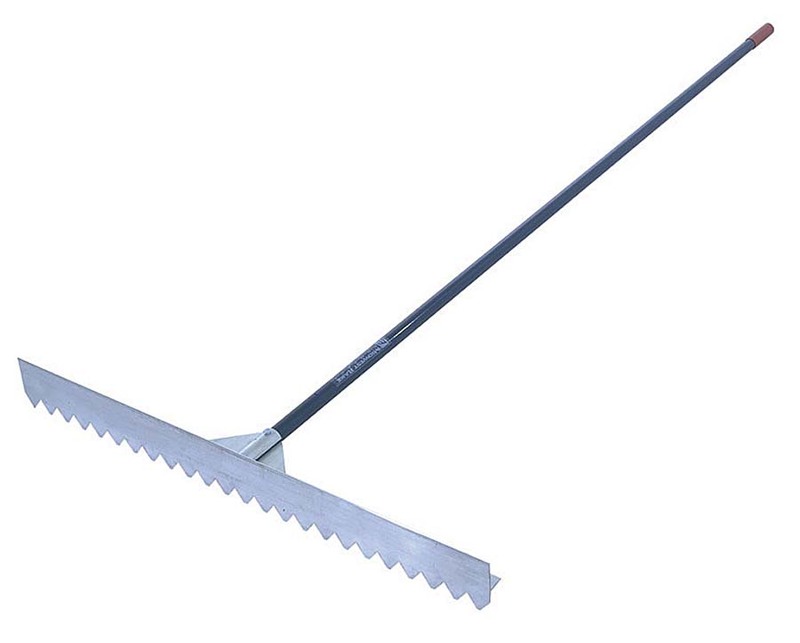 Another grooming option is the lute scarifier. On one end this rake is similar to the aluminum short toothed rake, and on the other side is a lute. The lute end is basically a straight edge that can be used for grading and leveling. The curvature of the blade improves the float capability of the blade when pushed backwards. 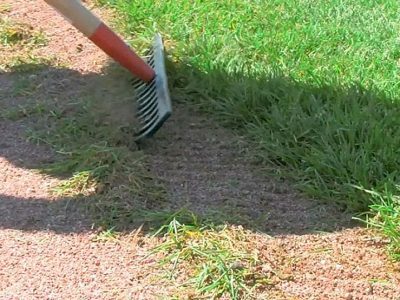 The fine toothed scarifier edge of the blade works particularly well on fields that have a topdressing layer on their infield skin surface. 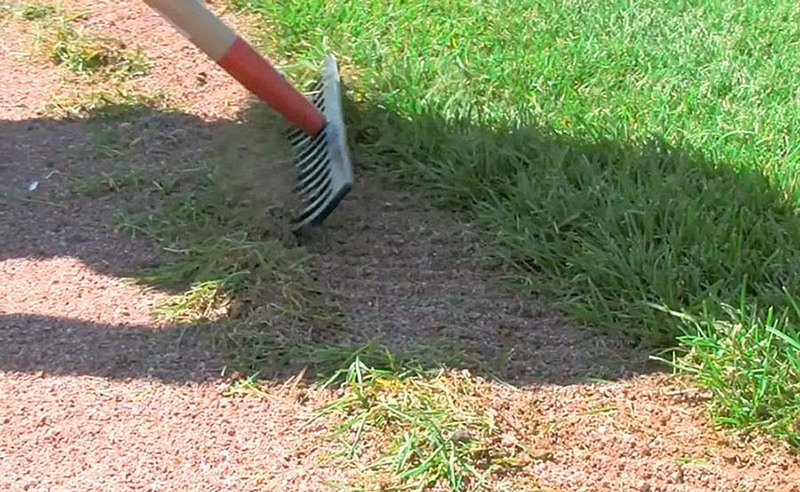 The scarifier teeth are short and only able to loosen up a shallow layer on the infield skin which prevents the groundskeeper from digging too deeply. 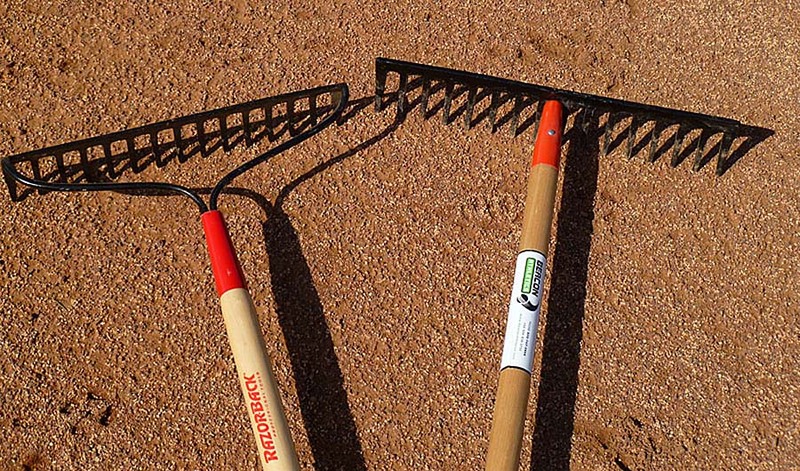 Iron rakes (or “garden” rakes) are used generally for more aggressive work on exposed soil areas. 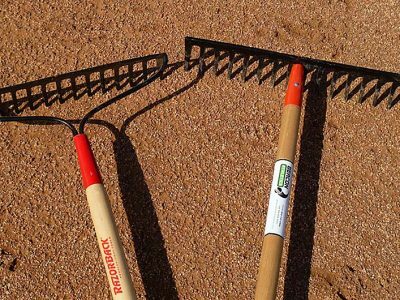 There are actually a couple types of iron rakes and it really makes a difference which one you choose. Iron rakes with a “bow” support tend to bounce more when pulled over tight soils like mound clays. The bow absorbs some of the down pressure you apply. A “t-shaped” iron rake does a better job of transferring your down pressure right to the head of the rake. 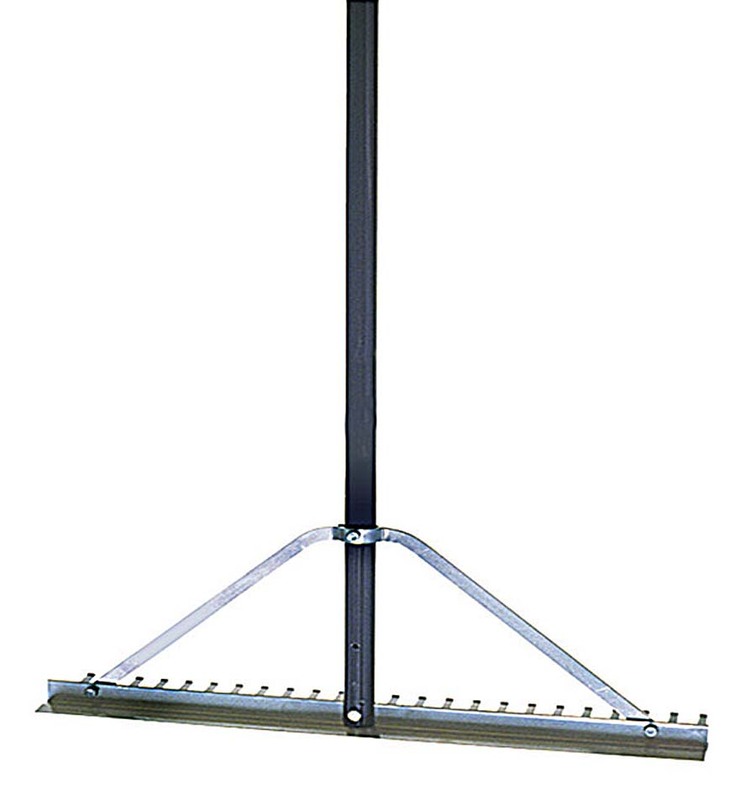 Sharpening the teeth of an iron rake can drastically improve its efficiency. The curved teeth of the iron rake orients the edge of the teeth for better cutting. Sharpening the teeth allows you to effectively cut through hard or firm soils with less down pressure. 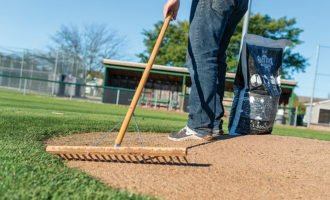 When you pick the right rake and when that rake is properly prepared you’ll be amazed at how efficiently you’ll be able to work around the turf edge and the clay areas around home plate and the pitcher’s mound. 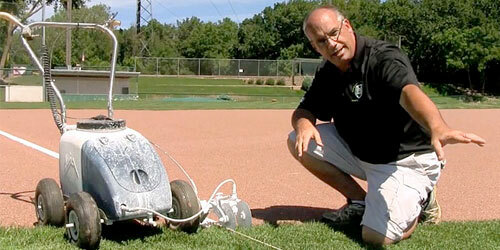 We’ll show you how to sharpen an iron rake in Module 102: Mound & Home Plate Care. 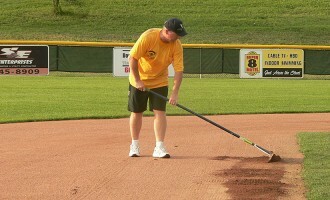 A fan rake — or “fall leaf rake” — is primarily used for managing soil buildup (“lips”) along the turf edge of an infield. The tines are flexible so they are unlikely to damage the grass. 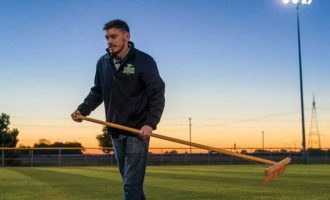 The tines are also wide so they can be effective for removing infield topdressing and soil that has been displaced into the turf edge. Shovels & rakes sounded simple, right? Ahhhh, but like anything, when you really get into it there’s always more than meets the eye.